Our Guild meetings are on the 2nd Monday of each month at 1:00 to 3:30 p.m. They are held at the Royal Canadian Legion, 2nd floor, 56 Kingston St., Goderich, Ontario. We meet ten months of the year, Sept.- June. Our meetings are structured to provide fellowship, learn about upcoming events, and participation in scheduled programs. Mini-workshops are offered in the mornings of most meetings to members by members to share skills, knowledge and techniques. 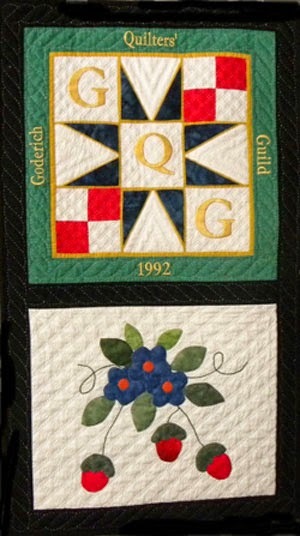 Goderich Quilter’s Guild ALWAYS welcomes new members, so if you are interested in participating, drop by any of our regular meetings, or send an email to Jane Dawson mjdawson@cabletv.on.ca for further information on joining. The Guild encourages visits from guests (guest fee: $7) who just want to enjoy a little camaraderie with fellow quilters. We have an extensive library of quilt-related books available to guild members. Patterns for a Block of the Month (BOM), as well as a care quilt block, are provided each month. We enjoy an inspirational “Show & Tell” at our meetings where members display their quilted items. All Guild activities and programs are optional – you may be as active as you wish. A monthly newsletter, “The Cutting Edge” is emailed to all members. Trunk shows and speakers are also a part of our Guild. We bring in well-known quilters from the area to speak and provide trunk shows or workshops. Our Guild is very active in charity work. We sew care quilts and pillowcases for The Women’s Shelter, CAS, A Room to Grow, Habitat for Humanity and others in our community in need of comfort. Our members are a caring, generous bunch of women who love to “give back”. Our number one goal is to have fun by meeting people, and sharing new ideas, show and share quilting projects, no matter how big or small, and support one another through our involvement in the Guild. The purpose of our Guild is to provide an organization that encourages its members to expand their love of quilting by offering inspiration and ideas by way of shows, displays, demonstrations, workshops and guest speakers. If you are a novice quilter, you will learn new techniques and gain confidence as you try your newly learned skills. If you’re not a new quilter, you will gain the satisfaction of sharing your skills through taking part in acts of generosity and caring. Something for everyone from the beginner to the most skilled. In October of 1992, Kathryn Caie held a meeting at the Goderich Museum to see if there was an interest in starting a Quilt Guild. The answer was an overwhelming "YES", and the Goderich Quilters' Guild began with Kathryn as our first President. We had a membership of 20 the first year, and many of them are still members today. The location of Guild meetings has changed from time to time, but we have finally settled at the Goderich Legion.